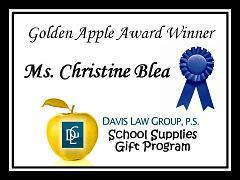 The personal injury lawyers at Davis Law Group, P.S., a Seattle-based law firm, is pleased to announce that Christine Blea is a recipient of the Davis Law Group School Supplies Gift Program. Ms. Blea is a 7th grade teacher at McClure Middle School in the Queen Ann neighborhood of Seattle. Ms. Blea was nominated by Lisa Fitch who is the McClure Middle School PTSA co-president. Fitch describes Blea as having a huge passion for teaching and instills a love of science in each of her students. She speculates that Blea spends hundreds of dollars of her own money each year on science projects supplies.